Based on the huge popularity of her first book for middle school students, Just Deal With It!, Diana Jenkins has compiled another collection of contemporary, humorous readers theatre plays. Also for middle school students, this collection is themed to fit special times of year such as the beginning of school, holidays, and spring vacation. Filled with humor based on typical anxieties of middle schoolers — peer pressure, fear of failure, jealousy and more — each reproducible play offers at least eight roles for a mix of boys and girls. Read more... Each play also includes a plot summary, prop list, and costume and presentation ideas, as well as ideas for further student reading. 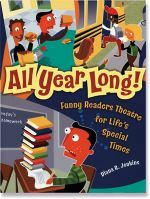 This engaging collection, which can be adapted to small group or whole class presentations, is ideal for teachers, librarians, and anyone else looking for laughs while promoting reading fluency and speaking and listening skills.